Home|Blog|Hosted Virtual Desktops|5 Reasons: Why Cloud Computing For Small Business? Many small businesses are migrating to the cloud and experiencing benefits that were never possible before. A study shows that in 2012, US-based small businesses used 4 cloud-based services on average, up from 1 in 2009. That number will grow to an average of 7 cloud-based services by 2015. Reduction of Costs: Cloud-hosted servers enable mass-scale computing power and minimize IT requirements and physical storage, providing a significant savings. Anytime, Anywhere: Cloud-hosted desktops allow users to access their files anytime, anywhere, using any device. Files are no longer stuck on one single computer. Ease of Collaboration: Saving and accessing files through the cloud allows everyone to work from the same master document. Administrators can even implement access and permission controls. Reduces Risk: The cloud adds security for its users by backing-up data off-site, decreasing the potential for hackers, viruses, and other cyber-security issues. Improves Efficiency: After migrating to the cloud, companies no longer worry about power requirements, space considerations or software updates. The cloud enables your IT infrastructure to evolve as quickly as your business does. Moving forward with cloud computing, either in a private, dedicated or colo environment, will bring your small business many benefits that directly impact productivity and security. Whether you are a retail, food & beverage, real estate or financial services small business owner, cloud computing is a practice that you will want to integrate and eventually adopt all together. So, do you think it’s time to put your small business in the cloud? Or are you finding it difficult to get there? We can help you! Take a look at your current infrastructure and determine what changes need to be made to get ready for the dinCloud. 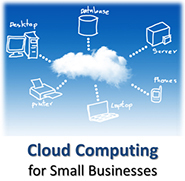 Most importantly, we will help you decide if cloud computing matches your small business needs.